Victor Wallace had spent almost 30 years in business, research, and academics before coming to KU in 1976 as the chairman of the Computer Science Department-a position he held until 1983. 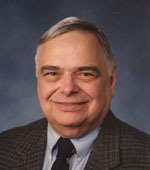 In 1993, he became a faculty member in the Department of Electrical Engineering and Computer Science and its graduate director. After earning a BS in electrical engineering, Victor Wallace joined the technical staff of Bell Telephone Laboratories in 1955. The following year, he joined IBM as a programmer. In 1957 he went to the University of Michigan, first as an instructor and then as an associate research scientist. He earned his Ph.D. there in 1969. Following a year as an academic visitor at the University of London, he joined the faculty at the University of North Carolina and stayed there until coming to KU. At KU, his teaching focused on computer operating systems, graphics, programming language, and data structures. Senior life member of IEEE and of ACM, ACM/SIGGRAPH, ACM/SIGOPS, ACM/SIGCHI, the Institute for Operations Research and Management Science (INFORMS), and the honorary societies Eta Kappa Nu, Sigma Xi, Tau Beta Pi, and Upsilon Pi Epsilon.